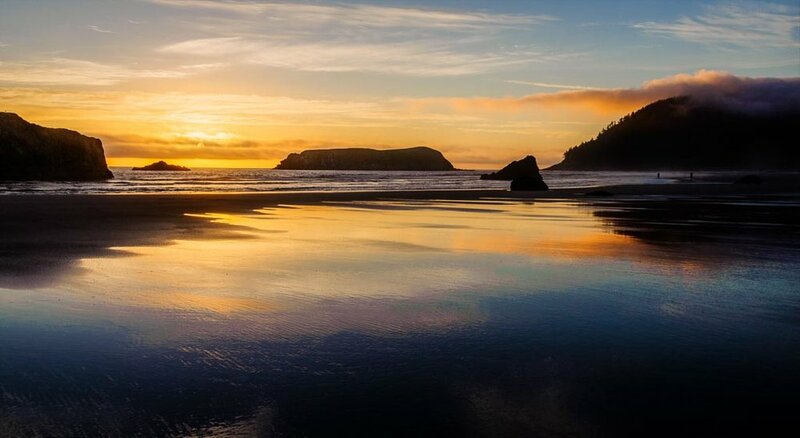 One of the best things about the Oregon Coast are its sunsets. Pick any beach along the 363 miles of coastline, add some clouds and you have the recipe for a terrific photo. The bonus from shooting from a beach is that you are almost always assured of getting a reflection that amplifies the beauty. Of course, one of the challenges of any coastline is the possibility of fog, many times thick fog. Why are coastlines susceptible to fog? Coastal fog usually results when warm, moist air passes over a cool surface. Coastal fog usually occurs when conditions begin to warm up but the sea (which warms more slowly) stays relatively cold. If that's the case, why isn't the coastal fog more consistent during these times? The easy answer is the wind that can blow the fog out to sea. What do you do when shooting in thick fog? Be patient and hopefully it will clear that day. On the day that I shot this photo, the morning was totally fogged in and I was unable to get anything. By the afternoon, the fog had cleared and, as you can see from this photo, was nowhere to be seen at sunset.